A Change In Philosophy For The Premier League? 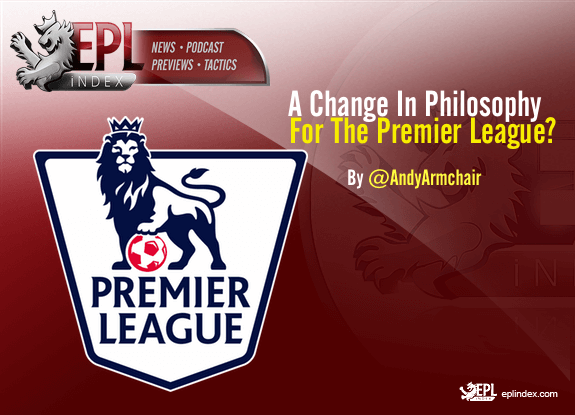 EPL Index > EPL Index Featured Article > A Change In Philosophy For The Premier League? Leicester City winning the Premier League was not just a shock of epic proportions that made news all over the world, it could well be the catalyst of a change in philosophical approach for much of the league’s teams. Whilst yes, it is a win that offers hope to many other clubs that the underdog can have their day against the big spenders, it’s perhaps the way they got there that could be their true legacy. Smart scouting and coaching are the Leicester success story, not huge transfer fees and contracts. The accepted logic in recent years seems to have become the clubs with the biggest wage bills win the biggest trophies; as though you can forget ambition if you don’t have the budget to match the most outlandish spenders. It’s great that the myth has been exposed because before football, or perhaps more specifically the Premier League, eats itself alive, it needs to go back to its roots and rediscover its fundamentals. Yes, the ‘big boys’ did underperform, which undoubtedly aided Leicester’s push, but that sense of complacency that one of the rich teams will win it because that’s just what happens was grossly misplaced. Also true is that Leicester were fortunate with injuries, but even that does not account for the level of performance achieved from a squad that, on paper, was a modest one. Claudio Ranieri has rightly been lauded for his part in the success, his motivational skills and handling of pressure was superb. Beyond the joviality was excellent game planning, immaculate drilling of a mean defence and flat-out top quality coaching. Mix this with some very good scouting from Steve Walsh to identify and secure the services of Riyad Mahrez from Le Harve for just £400,000, N’Golo Kante from Caen for around £5.6m and Leicester have smashed through the glass ceiling on a shoestring. That is the two players who were arguably the most pivotal to the Foxes’ title win, signed for a combined £6m. That combination of smart scouting and good coaching is common in other leagues and despite the ever-growing revenue, some Premier League clubs are switching themselves on to a more intelligent way of doing business. Southampton are another club utilising good scouting, coupled with a successful youth system to recruit players at a good price, develop them, sell them at a profit and then replace them with a youngster or another well scouted, modestly-priced player. It is a strategy well established in the Bundesliga that is not only helping to produce talented players, but also coaches/managers. That complacency of vast budgets does not exist and that places the emphasis on the ability to scout and develop. The luxury of riches has arguably induced a degree of laziness in the Premier League – throwing money around, rather than do the leg work. Elite money can buy elite players, but too often the Premier League spends elite money on less than elite players. Tottenham are a club showing signs of moving in the right direction, not only in manager Mauricio Pochettino, who has proved his credentials in emphasising team organisation and coaching, but also in scouting the right type of player for the right tight of fee. Jürgen Klopp at Liverpool is another who places an emphasis on the coaching and development of players and brings with him that Bundesliga mentality of scouting the right player with the right characteristics, rather than name value. He also showed in the January transfer window that he will not be held to ransom over a player, as was the case with Alex Teixeira. Incoming Manchester City boss Pep Guardiola is another who prioritises the coaching, hard work and discipline required to succeed. Whilst City will likely spend sizeable amounts on their squad, Guardiola will not accept tardiness and is likely to enforce a mentality change. He is another coach willing to blood young players, as he proved at Barcelona and Bayern Munich and although Bayern were a club willing to spend big if they had to, they are a club that doesn’t throw money around carelessly. Will large sums be spent by Premier League clubs this summer? No doubt there will be and there will likely still be some clubs desperate to be parted from their money, but what Leicester have done will have an impact; even if it is slowly, but surely. As more and more clubs succeed with a better strategised approach, the philosophy will change. Categories: EPL Index Featured Article, EPL Team Analysis, Leicester City, Leicester City (N), Manchester City, Manchester City (NN), Southampton, Southampton (NN), Tottenham Hotspur, and Tottenham Hotspur (NN).' 'Tags: Claudio Ranieri, english Premier league, Guardiola, Kante, Klopp, Leicester City, Liverpool, Mahrez, Mauricio Pochettino, Pep Guardiola, Southampton, Spurs, Tottenham, and Vardy.